Turns out it's book week here on the Quilt Dad blog! Yesterday I shared a bit about Deploy That Fabric by Jen Eskridge, and my giveaway of that book and a matching eco-friendly messenger bag is still open. Today I'm happy to share a bit about another C&T Publishing title, Scrap Republic by Emily Cier. I am lucky enough to count the talented Emily as one of my friends in the industry, as well as a former neighbor here in the Raleigh area and fellow founding member of the Triangle Modern Quilt Guild (before she relocated to Seattle!) 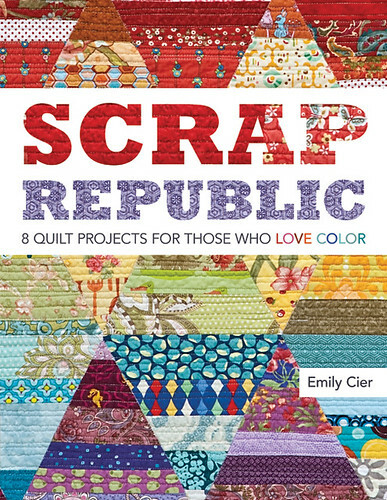 Scrap Republic is Emily's second book, following the success of Quilt Remix. Fun fact #1: when I first started sewing and quilting, I quickly found Emily's blog and was enamored by her amazing quilts and modern style. I was also in awe of the fact that she quilted her own quilts, at a time when I was so intimidated that I never believed I'd ever be able to quilt my own quilts. In fact, I think my introductory email to Emily was an inquiry about how much she'd charge to quilt my quilts for me. I remember that her response was something like, "errr ... uhhh ... you know you can totally do that yourself, right?" (OK, I'm paraphrasing.) She did, however, ask if I wanted all of her leftover scraps of batting for my doll quilts and minis. I'm still pulling from that stash to this day! Anyhow, back to the book. Scrap Republic is all about creating beautiful quilts with -- you guessed it -- scraps! Emily begins with a introductory chapter with tips on organizing your stash, categorizing your scraps by color, and block piecing ideas. That's followed by 8 original project ideas that are designed specifically to incorporate ALL of your scraps, regardless of color, pattern, or size. Love the patterns but don't have a stash to shop from? Have no fear. Emily includes yardage requirements for every project so that you can can exactly what you need to make each quilt. Fun fact #2: if you're an iPad user or otherwise prefer e-books, you can purchase PDF versions of both of Emily's books via the C&T site! Be sure to also join the Scrap Republic Flickr group to see others' quilts made from the book's patterns, and upload your own. Indigo is a color named after the purple dye derived from the plant Indigofera tinctoria and related species. The color is placed on the electromagnetic spectrum between about 420 and 450 nm in wavelength, placing it between blue and violet. OK, not much help. Well, for the purposes of the tour, the indigo "family" also includes browns, blacks, and greys. Perfect! Since the book is all about pulling from your stash, I thought I'd do a quick tour of some of my favorite fabrics in the color family ... straight from the Quilt Dad stash! First up, Denyse Schmidt's Katie Jump Rope line! Seed pods in brown from the Chrysalis line by Sanae! Droplets by Tula Pink (from both Full Moon Forest and Hushabye)! Grey dandelions from Patty Young's Flora & Fauna line! More prints from Denyse Schmidt (Flea Market Fancy + Hope Valley)! Black & white prints from the Mingle line by Monaluna! To win one of the prizes above, simply leave a comment on this post and tell me about your favorite brown, black, and grey prints. I'll randomly select 5 winners towards the end of next week. Good luck! There's only one more stop on the blog tour, so be sure to go visit my friend Allie tomorrow and say "hi"! Gorgeous grey but I have no idea who it is by! It was grey on grey with these huge beautiful modern flowers!! My fave grey print is Amy Butlers Floating buds in grey from midwest modern. 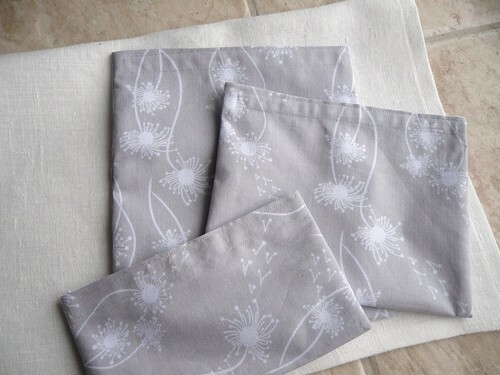 They are super soft and delicate and the off white background colour warms up any project they go in. I am just now getting into grey! I love it! I have a piece that I don't know who it is by but it has lots of colors in it! When I mix it with white it pops! Thanks for a chance to win! Some of the greys from Going Coastal by Emily Herrick are lovely, check out the gorgeous starfish and crabs. For browns, I love Aviary 2 by Joel Dewberry. I really don't use much in the way of blacks, but I do like the black on white trees from the Ghastlies. If you want a true indigo fabric, have a look at the blue prints from Rebekah Merkle's England Swings range, they are just gorgeous! I love Smirk Grey Best Dad by Kyla May for Timeless Treasures!! Too cute! I have a fairly good stash of black, moderate of brown and am just starting to stash grey. I never look at names, but do look at designers (love TP's droplets, btw). I can tell you I just bought a grey jelly roll of Bunny Hill Designs Putting on the Ritz - love those greys! Thanks for the opportunity to win - I love Emily's style! I love the grey in the Sunkissed line with the text on it, don't know what it is called, but I love it! I am in love with all things black, white and gray so there are too many in my stash to mention. I did just recently order the Rendezvous line which has some amazing grays in it. Thanks for sharing what seems like a great book. I love using solids in those colors. They kind of break up and calm down my wild taste in prints. I have one gray-Kona solid. I need to get more, obviously. I'm making a purple/gray quilt for our bedroom right now, so I have a whole stack of gray fabrics! My favorite is probably the Charcoal Dumb Dot by Michael Miller. But I also really love plain old Charcoal and Med. Grey from Kona. It's got to be grey seeds, FMF. There's no question!! Although I'm currently loving the grey toned hometown text print from Moda too! There's been a bit of brown in almost every quilt I've made. Browns in Cherish Nature, Lollipop, and Meadow Friends (boy). I would love to tackle some grey at some point though. Thanks for the chance to win!! Brown was my favorite color for years (I even wanted my bridesmaids dress to be brown). It's the color of the earth, and chocolate, whats not to love. I love using brown in with fall colors of orange, reds and greens. Black is a great basic especially as a solid for background or to frame other colors. Grey seems to be the new black! I've even started to wear grey something I never thought I'd do. It's another wonderful blending color and goes great with orange and teal, yum! right now I am really loving Little Gatherings by Primitive Gatherings. I love brown fabrics. DS fabrics are high on my list too. Thanks for a chance to win your giveaway. I must admit I don't remember to use brown, black and grey very much...I bet it would be good to do so. Right now I'm loving Kaffe Fassett's "Black Spots" which is periwinkle spots on a black background. Lynne at Lily's quilts has convinced me that spots are indeed, a neutral! Brown is a little more difficult to choose, but I think Echino's mini cars have to take home the prize. Grey Ghastlies are waiting to be quilted right now and I'm thoroughly smitten! 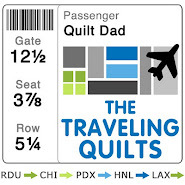 thanks for the giveaway, Quilt Dad! Hobby Lobby had a line that had gray & a bright blue in it...one was stripes and another maybe had an elephant...love that gray! Not so keen on indigo unless you are talking Navy Blue. I'm all into Navy since DH and I were in the Navy.. and now DS is in the Navy. Now when the Navy is talking Navy Blue, it is really much like... Black(ish) Blue. Strange huh. I know!! Our dress blues.. they sure looked black to me. I guess I'm not an "indigo" kind of gal. I occasionally use solid black for sashings but indigo prints - never except once when I made a wallquilt of loons I used black & white dots & feathery stripes - maybe that counts? I love tooooo many greys and browns so I'll just say the fabric I recently used on a bag that just flew to the UK...The Ghastlies grey is awesome and I paired it with some chocolate Canvas on the bottom. This book looks great! Thanks for sharing!! I love using gray scraps - some of my favorites are the elephants, Erin McMorris Weekender Go by Bike in the gray & lavender colorway, but the best has to be Heath in steel gray. Thanks! One of my favorites is Heath in gray, and I know it's a solid, but Iona Charcoal is just about my favorite fabric out there! Thanks for the giveaway. My favorite gray is from hope valley but also really loving silent cinema right now! I love greys and in particular the DS one which I'm trying to find here in the UK! Wait, you mean I need to have a favorite? That's like picking between your favorite child. Full Moon Forest is one of my favorite lines as well. At the moment I am loving "The Great 'I Am'" by Leanne Anderson - it is charcoal gray on black and beautiful!! I just bought a fabric with interlocking circles in shades of gray and black. I think it's from P&B, but can't recall the collection name. Anyway, I have big plans for it. I love those greys in Hope Valley! All colors are my favorite - I'm a scrap quilter. But to use a light grey as a background works great. Thanks for the opportunity to enter. Robert, in northern Iowa. I am a huge fan of metro living circles in pewter. I just bought some really neat grey houndstooth from joanns. The grey is really growing on me! the Miscellany collection by Julia Rothman, is in my cart at the moment and going to be my next purchase, i've seen so many cool projects made with it. The cloud 9 fabrics are my favorites at the moment. Am using a lot of black right now on a Halloween quilt! Sometimes working with black is a little intimidating, but oh it just pops out in a quuilt! Modern Workshop has some really nice brown prints, punctuated with bright colors. For grey I really like Daisy Janie's collection Shades of Grey. Awesome geometric prints and lovely shades. Funnily enough, I love black, and a large portion of my clothing is black, but somehow I don't have much in my stash at all. Laura Gunn's Painter's Canvas in black is nice, as are some of the Patrick Lose Mixmasters, the Moda Grunge in Ebony. Alexander Henry's Ghastlies are good for a variety of black/white/grey mixers and small prints (the clovers and brambles especially). My favorite gray fabric right now is the gray kelp print from Going Coastal. I love the little bubbles of the kelp leaves! I need to add more grey, brown and black to my stash. I don't have any favorites right now, but you gave me some ideas! I love brown, so the Katie Jump Rope line of fabric was perfect. I also like the deep gray color in the Far Far Away 2 (sleeping beauty)collection by Heather Ross. Can't go wrong with Kona Ash either. I just finished using up my stash of chocolat by moda.....love the warm browns. Next will be a brown and pink! I guess I like brown! Who knew? I don't have a favorite print. But I'm dying to make a black and white quilt. Just gotta pick a pattern and collect fabrics. I love the grey Go By Bike print. I rarely buy more than a half yard of a print, but I think I bought 4 yards of this one! Oh what a great book, I would love to win it (not to mention all the other cool prizes!) My favorite "indigo" fabric is a set of black and white prints I got a while back. they are all swirls and pretty designs and I just love looking at them. Its one of those fabrics I love to look at but hate to use cause then I won't have it anymore!! I first feel in love with gray in Flea Market Fancy...still hoarding the tiniest pieces and waiting for the re release! i absolutely love the gray and browns in flea market fancy! I like adding small pieces of black to bold color quilts; they create a little textile drama! I love black and white prints. I have quite a few by Blank quilting, but couldn't give you a specific collection. This book is looking very interesting and I will have to add it to my wish list, if I don't win one. Thanks for the giveaway. I love my Dilly Dally by Moda black and white fabric - it has flower petals outlines in thin black on the pure white fabric. Very nice! I love the Katie Jump Rope and I also love solids in these colors. Thanks for the chance to win. I read your post and immediately searched out those great elephant prints! Super cute! I love any of the Kona solids in the dark brown, grey or black range. There is a blue that looks like denim that reminds me of a new pair of jeans. All of these colors pop with whites, oranges and acid greens. They are such fun to work with. My favorite brown print is a brown background with white daisy that I used as backing for a brown/aqua quilt for my daughter. The color reminds me of chocolate! I've just started collecting black & white prints, so I don't know enough about them to list a designer. But I'm going to check out the tons of great suggestions in these comments! Not sure I have a favorite, but I love the large black and white prints that look so good on bags and purses. I know grey is the big thing right now, but I don't think I've ever used grey in a quilt. I don't think I even have any! I do have some dark indigo blue that I'm saving for something. Just haven't figured out what yet! Now, brown, that's one of my favorites. I have lots of browns, and use them all the time. Love my browns! My favorite browns are Tula Pink's Full Moon Forest fabrics - especially the squirrels. My favorite blacks are from Moda's Half Moon collection. I don't think I have a favorite gray since I've never used gray in a quilt before. I am just getting into greys and using them as a neutral. I did see a great quilt that had greys with just one other color that looked really good! I just used a gray print from the Ruby Star Rising line that I love, and I love a Japanese print I have that has white hippos on a gray background. I love grey fabric. I made a dress with a yellow and grey print from Joel Dewberry's Aviary 2 line. I have pieces left that I plan to incorporate into a quilt. I also love Kona medium grey and coal. They are staples in my stash! I love a deep brown with white polka dotss - not sure of what the line is. I had the most beautiful black on black. The design was zebra. I only bought one yard and have been sorry ever since. I really like the greys in Puttin' on the Ritz by Moda! Lately I'm really loving the Sweetwater Hometown gray prints and I'm using them in a quilt with light blue and yellow. "Grey dandelions from Patty Young's Flora & Fauna line" looks very nice. Going to go see if I can find some. I'm currently having fun collecting grey fabrics for a yellow & grey quilt. Love the Silent Cinema line and the Citron Grey from Michael Miller. I don't have a favorite line, but I've been using some prints lately that have brown and black together in them. I think that combo looks pretty classy. I just today discovered the Renaissance Stonehenge Line of fabric. It is a great line of gray and tan. It is my newest favorite. I'd love to win this book because I love scrap quilts. I haven't worked much with gray or black, but did use some brown prints in a Bonnie Hunter mystery quilt called double delight. I don't know what line these browns came from as they were pieces from my scrap stash. HAVE YOU SEEN 'TUXEDO' A NEW COLLECTION OF BLACK/WHITES? THANKS FOR SHARING! Can't wait to play with them! My favorite gray is a 36" fabric in my stash which was inherited from someone's mom. It has funky pink mushrooms, and baby blue trees. My favorite browns are from Jo Morton's lines. And I LOVE all the black and white prints that are out there now! I have never been a big grey/gray fan until I started following blogs this year and seeing how neutral and wonderful it really is. I like the gray in the Hometown fabric line. I've been leaning toward brown a lot lately in my quilts. Beige, tan, brown, I use them all lately! 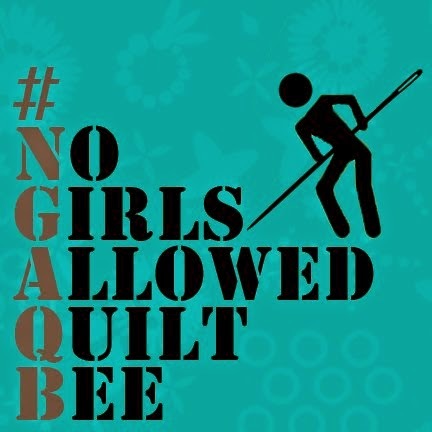 It was the basis for a neutral log cabin quilt I have hanging on my entry wall, love it! Michael Miller Urban Grit - love the ornate crosses are great and send in the crowns! I love these colors. thanks. I'm getting into browns right now- some nice geometric prints. It pairs so nicely with red and oranges. Really getting into Fall colors this year. i haven't found a favorite black print yet, other than the moda bella solid black. But i love using that. my favorite brown is the henna garden brown. My new favorite grey fabrics are from Sweetwater's new line, "Hometown." I love that they're subtle but have great personality. thanks! Brown/Black/Cream/Beige is one of my most consistently favorite color schemes. :) Love those black and whites, too! I love the browns in KJR also and Jan DiCinto's Shades of Grey line. I love deep brown, black, and grey prints. I really love some of the aviary prints too! and the impressions line. I have NO brown or black or gray or indigo scraps, but I really want to win this book! It is right up my scrappy alley! It's possible that I could be convinced to visit a quilt store for a few dark fat quarters if I had a pattern that called for them, you know. I love the organic fabic series shades of grey by daisy janie! I'm planning for a white and grey wall hanging just now, so thanks for your inspirational photos! Thanks for hosting the giveaway as well!! I have a set of fabrics in white, cream, tan, gray, brown, and black set aside to make a neutral quilt. I love these fabrics. Google is not working for me today!! I don't know who it's by, but I have a great fabric that's white with grey bicycle wheels all over it. I love grey with pastels! There are so many that I love, but I seriously adore the Metro Living circles in Pewter. Such a great neutral! I love the Basic Grey prints. I love the Stonehenge Line of fabric, so I'd have to say any of their grey or black tones. Thanks for the opportunity! 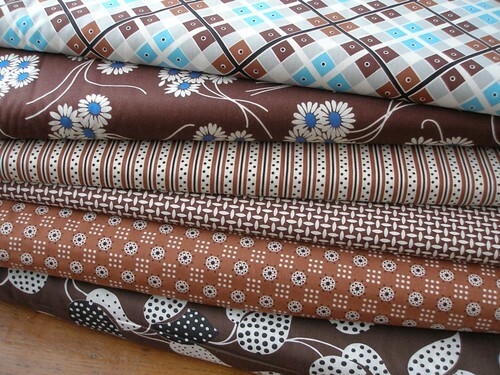 I really like brown moda grunge fabric, and FMF gray seedling fabric too! My favorites are the Kona cottons, in shades like ash and charcoal. I love how they make the other colors shine. Currently I'm liking the Nutty Owls Retro by Suzy Ultman for Robert Kaufman Fabrics and also Chandler Cocoa/West Indies by Jennifer Paganelli for Free Spirit Fabrics. Ty Pennington's Impressions line and Joel Dewberry's Aviary 2 line both have some beautiful prints in brown, gray,and black. THANKS for the chance at one of these generous prizes! In browns, Presents Spa by Rosemarie Lavin for Windham. In gray, Inner Light Gradations by Debra Lunn & Michael Mrowka for Timeless Treasures, and Nearly Neutral by P&B Textiles. These are all older prints, but I still love them. i love the underwater print from cloud 9's new line across the pond. Patty Young's Grey Dandelions are one of my favs! There is something about it's crisp, coolness that speaks to me. I never used to be a fan of blacks, browns, or greys but they really work well with alot of colors so I'm really getting into them. Thanks for the chance to win. Love those Elephants in black.......how adorable. As far as black /white fabric...I'm partial to the McKenzie line by Dena Designs! Jenean Morrison for Free Spirit!! I love black & white & grey prints. Don't use them in quilts so much but a lot of bags and other projects...tho I'm thinking about a black/white quilt after this! Lol I like far too many to pick one favorite, but I'm liking Michael Miller's grey lines right now. I have a large collection of black and whites--just starting to collect gray. I bought a collection at Quilt Boutique in Henderson NV that also has yellow--not sure the designer. I love your Denise Schmidt grays. 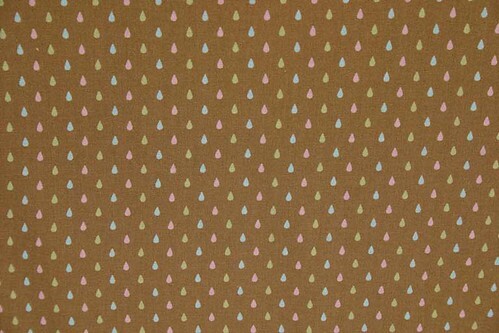 Love the New Day palette from Denyse Schmidt's Hope Valley (also my favorite line of fabric)! Thanks! I love any brown that is a rich in color as chocolate is in flavor. I am currently in love with the white scrollwork on gray print from Ruby and the varied starburst looking gray print from Hometown. Moda's chocolate brown tonal oval print is fabulous, too. I picked up an awesome brown and limey green flower print a bit ago (for ME). Not at home though so can't tell you what it is. Haven't used black, but love those elephants. Lovin' the new grays in the Ruby line by Bonnie and Camille! And of course the Ghastlies for this time of year! LOL! Thanks for the chance! I've recently finished three quilts that incorporate grays and am loving the combination of grays with a pop of color. It just might become my new neutral. Haven't tried the indigo blue direction yet. I need to add some gray to my stash. love the elephants. thanks. I've used the Moda black marbel, Kona brown, and some brown in my current quilt I'm working on. I don't think I've used gray. Lately I have been on a black & white kick. I make bags/purses & I just seem to gravitate to the black & white. I recently took over a bedroom for my sewing room. Once I organize my scraps it will be interesting to see what color dominates. I'm guessing it will be the black & white. Thanks for the chance to win some fabulous prizes! Thanks for the chance, and I love that grey dandelion fabric you have! I don't really have a favorite print or designer, but I love gray...love that it goes with everything but it's not as harsh as black. Thanks! thanks for the post - my favourite grey prints are daisy janie's shades of grey. I love the Miscellany by Julia Rothman. Cool colors and graphics! I love deep chocolate brown with bright colors! Thanks for the chance to win. My favorites right now are Denyse Schmidt's Katie Jump Rope line! Awesome! Hi! We just got a grey couch delivered on Saturday, so I have been on the lookout for them lately. I am loving the "Puttin' on the Ritz" greys from Bunny Hill. Don't have any yet, but they are on the list! I like the grunge brown of Basic Gray's Origins and also the grey/blacks in Hope Valley. While not exactly indigo, Kona New Navy is also nice to use with solids. Thanks for the giveaway. I guess I'm uncool! I do not know the names of any gray, black, or brown print that I know of. Wait, I have some Ghastlies in gray! That,I do love. I saw a line of gray prints at a quilt store the other day that I LOVED! It was all gray and white with accents of teal. But I don't know the line. I have to say blacks and grays are not something that had a large amount of real estate in my stash until lately. I inherited from a dear friend her hoarded stash of fabric most of it vintage (at least!) in that stash was an enormous bag of black/white, black/gray, and gray/white strips. They are just gorgeous! Since then I have added a few companion fabrics to that bag so I can turn them into something wonderful.....maybe this book has some suggestions!! I have no black, gray or brown since I'm not a stasher yet. Being new, I only have the scraps of baby quilts! I love black fabric with white polka dots though. Pin dots, big dots, whatever! Especially in scrappy quilts, I find black and white with bright colors very eye-catching. I love Julia Rothman's Miscellany line! I bought it recently and can't wait to use it. Such a great line-up of fabrics. Thanks for the chance! 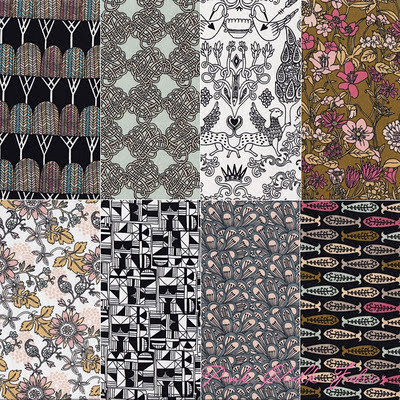 For browns, I really like "onyx all is bright" by Hoffman fabrics. I'm not a lover of Christmas fabrics, but I really like this one. For grey, I love the combo if the color combo in "ciron gray' by Micheal Miller fabrics. For black, I really like fabric that has words on it, like Sweetwater's "authentic" line has. Thanks for the chance in this give away! I love the black and gray Heath fabrics as mixers, and I have a few fat qtrs of Wordplay that I haven't used yet and LOVE them with their type in blacks and grays. I like most black fabrics. The ones with the bright color spects are my favortite. Gray is not my favorite to work with, but often can make or break a quilt I've noticed. I love the rich chocolate shaded browns. Have you ever noticed how well brown and blue go well together? Love the brown woodgrains by Joel Dewberry and FMF grey seeds. I like Hometown Mist Cross Town I just really like the pattern and the color of bluey-gray. I really don't have much brown and black in my stash. What little I do have is from making civil war quilts. Now I'm also learning more about "modern" quilting and some of the great new designers, I can't wait to start buying some of their fabric. Thank you and the Sponsors for the giveaway and the chance to win. I have the grey dandelion print you showed and it is a favorite of mine. I have a pretty good assortment of greys and browns and blacks because they go with just about everything. I do like those black elephants you pictured, but normally I like brighter colors and steer away from blacks, browns, and grays. Gray is my favorite color of the moment so I have been enjoying the throwing together of shades of gray by themselves as well as sometimes putting them with a bright color. Since my entire house is decorated in Grays and black- getting to see a glimpse of your stash gives me so many ideas! Thanks for the giveaway! 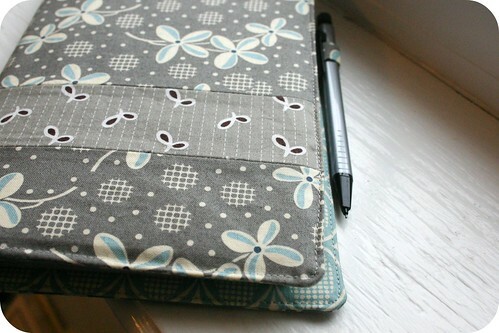 Oh, grey has me by the heart right now, and the grey Dandelion print is WONDERFUL! Thanks for the chance and the intro to this fabulous new book! I love your selection of fabrics! Just picked up a nice Joel Dewberry print of gray and pink. Thanks for the give away! I just bought the entire collection of 8 prints in Miscellany. I love them all! They are going to make a great neutral throw quilt for my living room. My favorite grays and blacks are in Michael Miller's Mini Mikes line. The logo always makes me think it's intended for children's stuff, but I think the small geographic patterns are perfect for quilting. I have been collecting black and grey fabrics for the last year. I plan on making a black/grey/white quilt with accents of hot pink. I went to a shop hop this past weekend and found many different prints. Now I need to find the perfect pattern. I love Daisy Janie's Shades of Grey! I'm really loving the brown and blue argyle in the Sweetwater Pure line. Don't think I will ever get tired of blue and brown together. Thanks for the chance to win! I am loving the grey shades in Puttin on the Ritz, but they are not in my stash yet. I love bold black and white prints as well - have a stash of these for a quilt. So, I'm kind of a simple gal - my absolute favorite is Kona Charcoal Gray. I have a big stash of black and white fabric because I am so drawn to them...but haven't really used them in a quilt yet. Lately I have a new interest in gray, I think it is an age thing. would be a great addition. Thanks for the chance to win this great book. 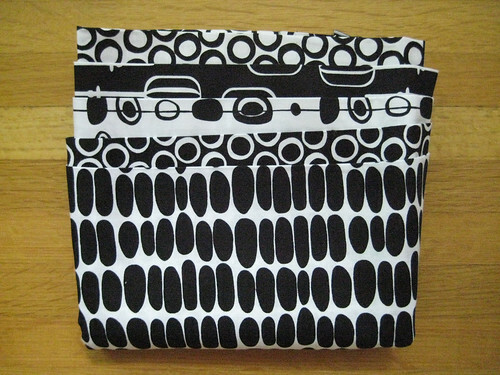 There's a black & white teacup pattern I love in a group of fabrics called "Penelope". I will be completely honest and say that I don't like browns, blacks or grays. I have always liked the pink and brown and blue and brown color combo, but feel it's a bit overused now. I like quilts and projects I've seen made with gray as a neutral, but can't stand the fact that it is the new "it" color for a neutral. I actually cringe when I see gray included as one of the color palettes in a new fabric collection. I know, I know, such a Debbie Downer! I'm sorry, I just can't get used to the gray. I need color, lots of color! I went through a repro phase in the 90s, yielding a stash with a lot of browns. Now, it's not really a colour I reach for. 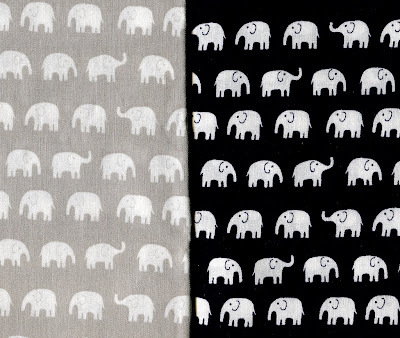 I do love grey though, and have been lusting over that elephant print forever. I love black and gray metro living circles! I don't have a favorite right now...if it works in my quilt then I LOVE IT! thanks for the opportunity to win this book! I like Amelia Cotton Bold Black Dotted Swiss, A Ghastlie Night in smoke, and Little Gatherings Brown Sugar Rosehip. Thanks for the giveaway! Hmmm... I don't have that many black, brown or grey prints, though I do love these colors. I guess my favorite stash print would have to be grey's from Sherbet Pips! Denyse Schmidt Hope Valley is what is in my small stash. Thanks. I love the earth tones in Forest Fun by Amy Schimler. Kinda mixed in with fun bright colors. Blue is my absolute favorite, so I have a bunch of bright blue with fishes on it that I"m sewing into things for the boy child. My favorite black prints are these Atari and Pac Man looking ones from Timeless Treasures I think, though I have no idea what the line is called. I love the greys in Puttin' on the Ritz. My daughter is expecting a little girl the end of this month and she is decorating baby's room in pink and grey. I love brown and black solids and prints. I haven't used grey, even though I like projects I see others do in greys. I will have to give greys a try! I love the browns/blacks/grays (which verge on blue) in the Kaufman Imperial 7 collection. I have a big stash of black, grey and brown! I am making an entire quilt black, grey and white that'll be subtley halloween flavored (so I can use it all year). Ghastlies Sebastian the cat is my favorite for that project. And I'm not sure why I have so much brown... it's just so warm and great. My all time favorite black is the white circles on black background from the mingle line. Love love love it. favorite gray is the gray elephants from daiwabo. also love the metro circles/dots from kaufman. I like the brown version of Joel Dewberry's Ironwork. I just bought the Midwest Modern Optic Blossom by Amy Butler to make curtains, I love it!! I just picked up a fat quarter at my quilt shop that is mostly yellow with grey in a floral pattern (daisies) I wish I knew who's line it was maybe Moda's? I have been enjoying seeing grey come up more often and its not boring or industrial looking at all! I love what's being done with it out there. I love Amy Butler greys, Moda & Joel Dewberry browns, Moda blacks, Luna ? and too many others ! Thanks for the chance to win ! I have actually just picked up some Ikea fabric-shades of grey with classic roses. I don't actually like their mod type designs but this is very sweet. In limited supply but hopefully soon re-released FMF gray seeds is my favorite hands down. Thanks! At the moment I'm really into "The Ghastlies" fabric by Alexander Henry.. love the grey and blacks in all these fabrics.